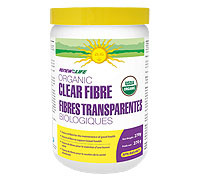 PLEASE NOTE: Organic Clear Fibre can also be added to soft foods such as yogurt or apple sauce, but may not dissolve as well as in room temperature liquids.Organic Clear Fibre contains no nuts, peanuts, sesames seeds, mustard seeds, wheat, gluten, yeast, corn, eggs, dairy, soy, Crustaceans, shellfish, fish, animal products, artificial colour or preservatives, binders, or fillers. Renew Life does not use genetically modified ingredients. All ingredients are Non-GMO. Warnings: Consult a health care practitioner prior to use in the presence of abdominal pain, nausea, fever or vomiting. Do not use if you have difficulty swallowing, and/or have a bowel obstruction. If you experience chest pain, vomiting or difficulty swallowing or breathing after taking this product, consult a health care practitioner. 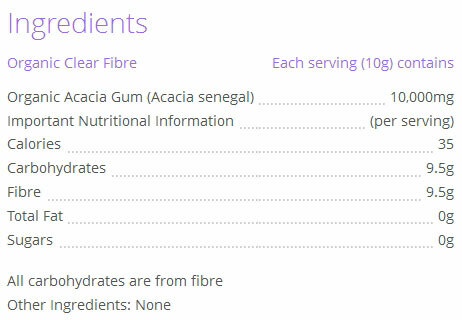 Do not use if you have Diabetes mellitus in which blood sugar is difficult to regulate. Consult a health care practitioner prior to use if you are taking medications which inhibit peristaltic movement (e.g. opioids). Consult a health care practitioner prior to use if you are pregnant or breastfeeding. Not recommended use with carbonated beverages. Keep out of reach of children. No refrigeration required. Store in a cool, dry place.